Today I have a Christmas-themed video for you. I was tagged by Jennifer from The Family Fudge. She created this tag with Becky from A Place to Nest and the questions are quite fun. You will learn what I really think of Black Friday, whether or not I like egg nog and what my favorite ornaments are... and one of them has a funny story behind it! 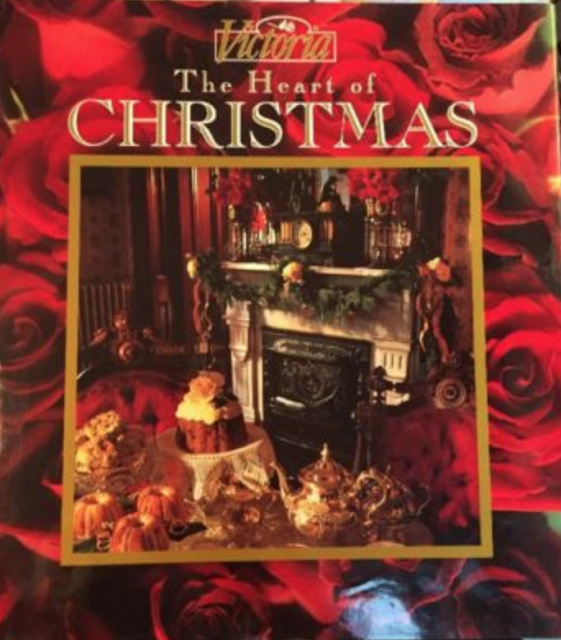 The book I mention in the video is Victoria's The Heart of Christmas. This is a beautiful book showing Victorian decorating and customs during Christmastime. To continue the videos, I tag Jen from How Jen Does It, Melissa55, Terigigi, Kathryn Morgan, Nikki from Inspired by Nikki, Hilary from My So-Called Home and Angi from A Return to Simplicity. In addition to the ladies I have tagged above, I would love to tag you too. Let me know your answers in the comment section, or do your own blog or video on the subject. I look forward to seeing your responses! 1. What are your feelings on "black Friday" shopping? Are you brave and head out with the crowds, do you shop online or do you avoid it all together? 3. Christmas cards, yay or nay? If you do send cards what style do you go with? I.e. traditional (no photo), photo, funny or classy? 4. If you were a Christmas elf, what would your specialty be? Reindeer wrangler, chief decorator, toy maker, gift wrapper, baker or management? 5. Egg nog...do you pour a tall glass or do you throw it in the trash? 6. What is your Christmas decorating style? Classic red and green, shabby chic, country/farmhouse, colorful/jewel toned, etc? AND does your style change from year to year? 7. Favorite childhood Christmas memory? 8. If you could borrow Santa's sleigh on Christmas Eve, where in the world would you go? 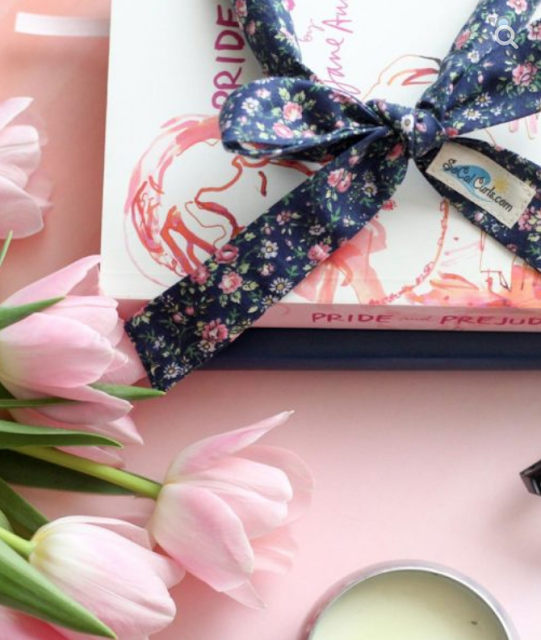 The Madame Chic books make the perfect gift for any special lady in your life. 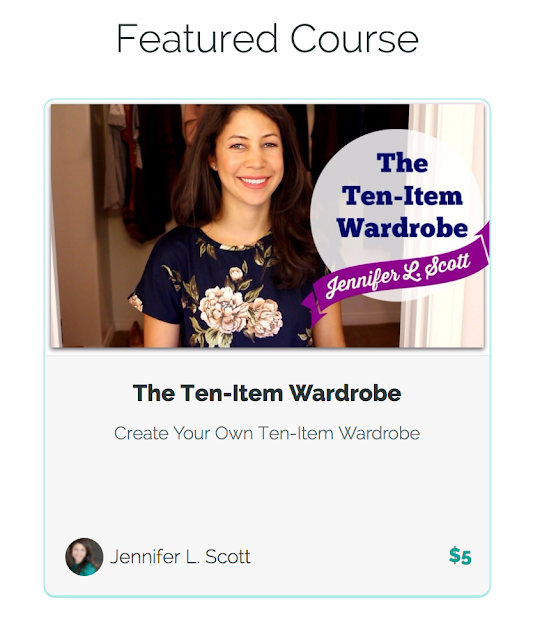 Take my new eCourse on the ten-item wardrobe. With over an hour of never-before-seen video instruction, notes and quizzes, you will feel prepared to create your own ten-item wardrobe. For those of you who already do the ten-item wardrobe, this course will keep you on track and provide further inspiration. The course is self-paced and includes a lively comment section with other ten-item wardrobe enthusiasts. Enjoy! Lipstick, nail polish, a great pair of shoes and of course... Madame Chic! 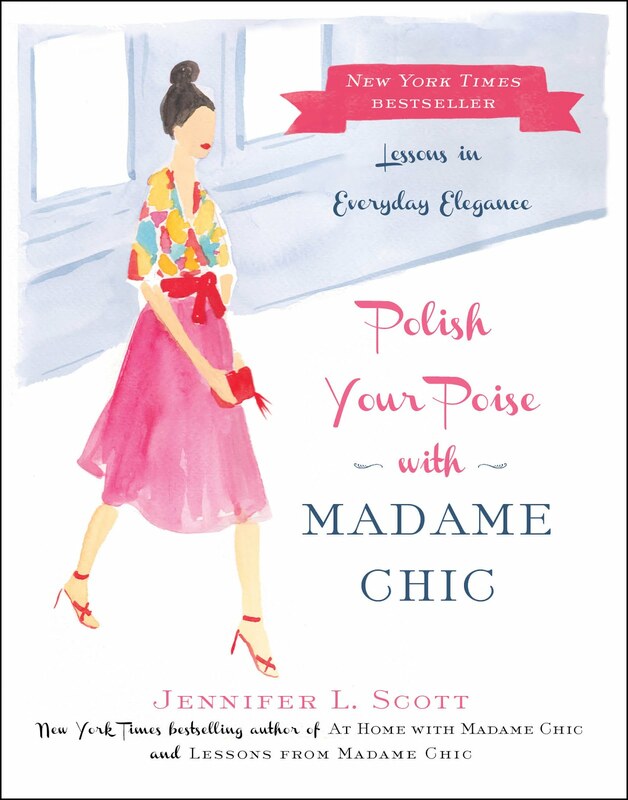 ... and Polish Your Poise with Madame Chic along with some weekend essentials. I read Neil Postman's Amusing Ourselves to Death! It's such a brilliant book, far ahead of its time! I wonder what he would have said about the current challenges we face viz. easy distractibility due to smart phones, 24*7 TV channels, internet connectivity, celebrity culture etc. it's not easy to be a social critic & I know you receive a lot of flak from some of your readers for the topics you discuss on the blog viz. dressing appropriately in public, cell phone etiquette, adulting etc. But please keep up the good work! We find your social commentary very wise & inspiring! Love!! Hi Serenity, thank you so much! Postman's book is a very important commentary on our society that still rings true today! Thanks for your encouragement. Thanks for joining me today for another video. I would love to hear some of your answers from the Christmas tag. Let me know in the comment section and your comment could be chosen as comment of the week on The Daily Connoisseur! In today's video, I'm sharing how I like to wear leggings to make them look presentable. tunic (or dress) + leggings + scarf or statement jewelry + quality shoes = presentable outfit! Regarding what I'm wearing in the video, the leggings are from Amazon. The tunics are from zulily. The ballet flats and driving shoes are London Sole (French Sole in the UK). The ankle boots are from Aerosoles (purchased a few years ago). The rain boots were purchased from a boutique in Los Angeles many years ago and their label has worn off so I do not know which brand it is... but I believe they were a brand called Dirty Laundry. I often get questions about what camera I use, it's a Canon. Leggings can be a great choice to wear during the day to maintain an active lifestyle. Styling them with a long top, tunic or dress dresses them up. This is another great option if you are coming out of a work out and want to run errands. Simply throw a tunic over your workout top, slip on some flats or boots and you are suddenly very stylish and ready to go! 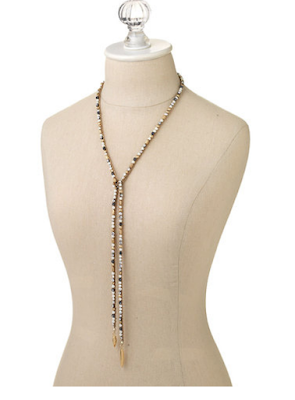 Thank you to my friend, Lucy Wheeler, for offering to give away the Zoe Lariat necklace I'm wearing in today's video. The giveaway is open worldwide (not just US). To enter you must be subscribed to my YouTube channel, The Daily Connoisseur. 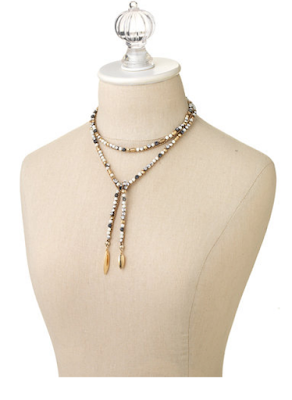 In addition to how I wear it in the video, here are the different ways you can wear the necklace. The giveaway will run for two weeks. The winner will be contacted by email directly, as well as announced on this blog, on Monday, December 11th. Best of luck! Intentional Simplicity shares her favorite things... 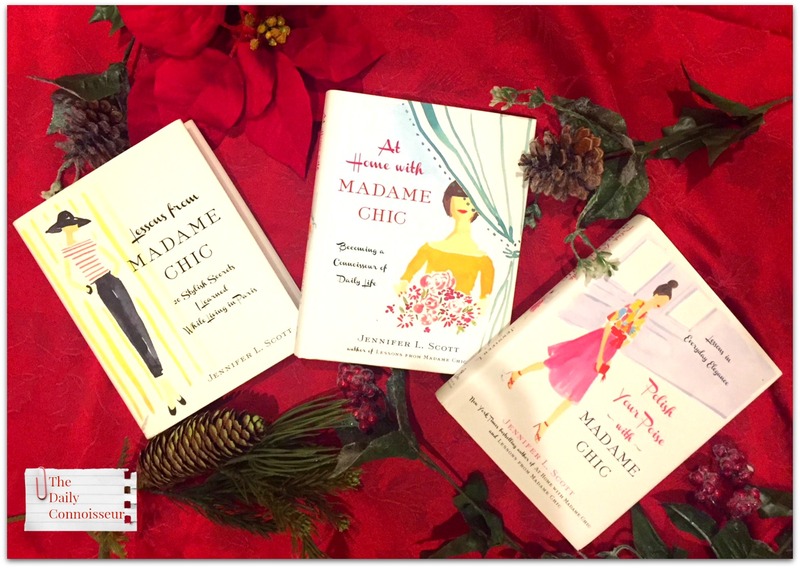 The Madame Chic books! Regarding last week's Teatime with Jennifer episode on the Dry Clean Dress, Karolina writes, "Hi Jennifer! My name is Karolina, I’m 22 years old and I’m from Poland. I like so much your sense of humor and I really enjoyed your video! It shows exactly what modern fashion looks like. Actually, it reminded me of a short tale written by Hans Christian Andersen- The Emperor's New Clothes. A vain emperor cared about nothing except fancy and expensive clothes. He wasn’t satisfied with what he already had, so he paid two weavers to make him the most luxurious suit of clothes that they say is invisible to those who are stupid or incompetent. So obviously nobody dared to question the existence of the Emperor’s new clothes. And what happened? An innocent child in the crowd blurted out that the emperor was wearing nothing at all. His vanity led him to public ridicule. And that’s the point! This Moschino dress, what was the designer’s purpose in creating such an extraordinary piece of clothing? People are afraid to criticize high fashion brands and even desire their costly clothes. Just because they’re famous? Your idea with dry clean dress was brilliant! In this video you acted like the child from Andersen’s story :) You just showed the truth :) Thank you so much for this video! Greetings from Poland! Pozdrowienia z Polski! :)"
Hi Karolina, I enjoyed your comment very much. I enjoyed your correlation between the dry clean dress and The Emperor's New Clothes. Thank you and I hope to visit Poland one day! Today, I would love to know... how do you like to wear leggings? I hope you have a wonderful week. See you on Thursday for the Very Merry Christmas Tag. I hope you had a wonderful Thanksgiving celebration! We had an awesome day with family, lots of food and even more gratitude. I hope your Thanksgiving was equally as joyful. Now that Thanksgiving is over, it's time to plan for the holiday season. 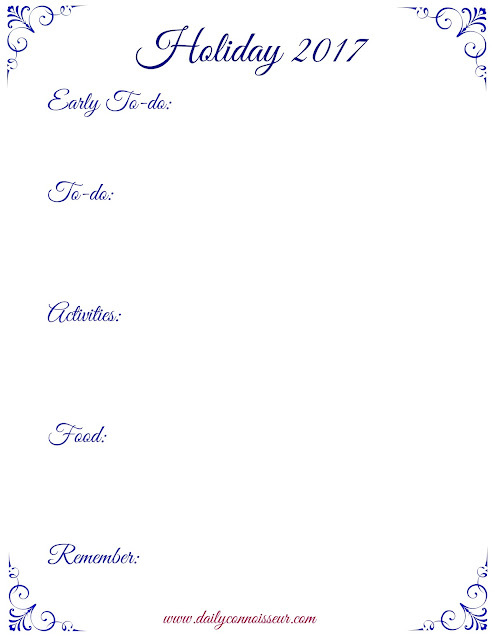 In my planning post from last year, I show you how I organize our activities and to-dos in list form. 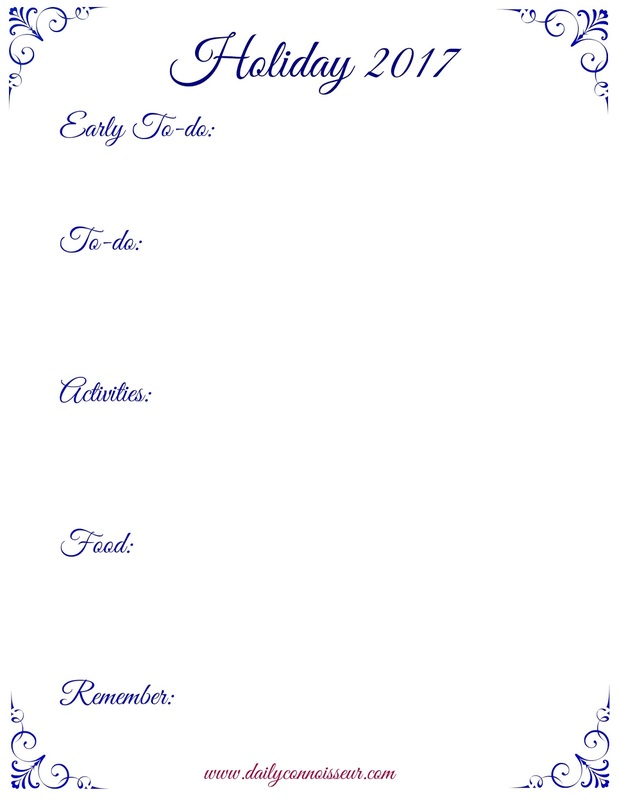 This year I did the same thing and created my own custom Daily Connoisseur printables which I am offering to you for free. Simply download the PDF files and they are yours. I hope they help to keep you organized this season. ...as well as a Holiday list. Click here to download the Christmas list. 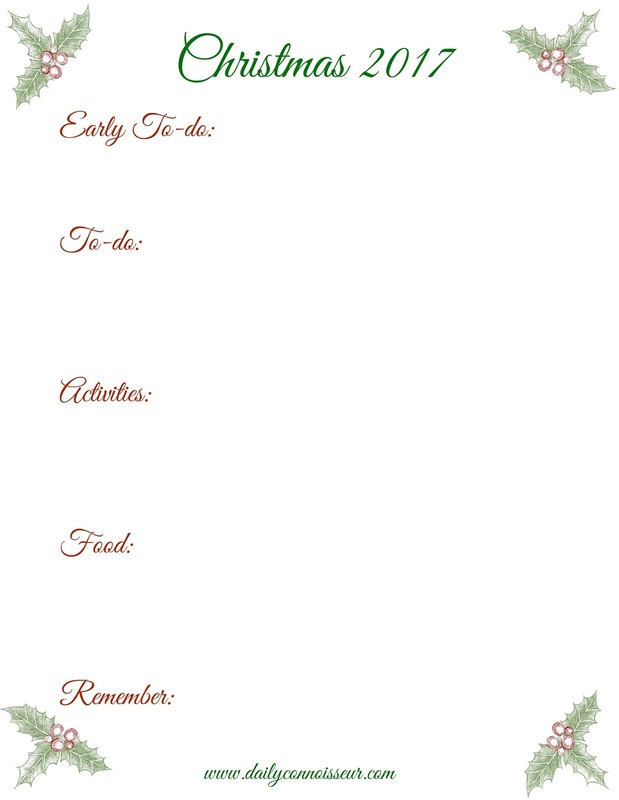 Click here to download the Holiday list. I hope you enjoy today's video as we plan together for the Christmas season. My book, CONNOISSEUR KIDS, will be released in the fall of 2019 from Chronicle Books. Read all about it here. Caroline H. writes, "This was a lot of fun to watch! I can't imagine that I would ever buy such a dress- but beauty is in the eye of the beholder! I watched a few fashion shows online and the one thing I just don't understand- why do the models not smile? I saw some exquisite designs but the models wearing these gorgeous clothes looked miserable! If I had the opportunity to wear Oscar de la Renta or any other great designer, better believe I'd be smiling about it. What is the saying? You're not fully dressed without a smile? 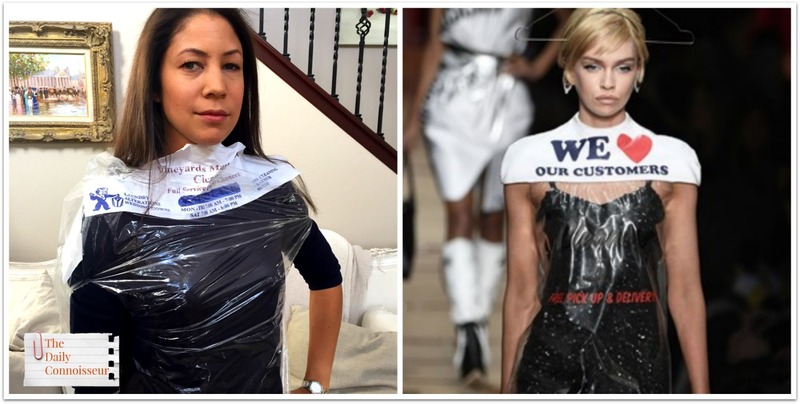 When you asked who wore the plastic dry cleaning bag better- the answer is you! Just goes to show, even if you are wearing a plastic bag- it will look better if you smile!" I agree, Caroline. I wish the models would smile too! I don't know how the Moschino model kept a straight face. As you can see from my video, I was not very successful at it! Have a wonderful weekend, everyone. I hope you get great use out of the printables. See you on Monday for a video on how I wear leggings and tunics. If you liked my necklace in today's video, be sure to come back for Monday's post because we are giving one away. It's the Zoe Lariat necklace by Stella & Dot, sent to me by my friend Lucy Wheeler. Stay tuned! In today's special fashion edition of Teatime with Jennifer, I'm wearing my own version of Moschino's dry cleaner dress. 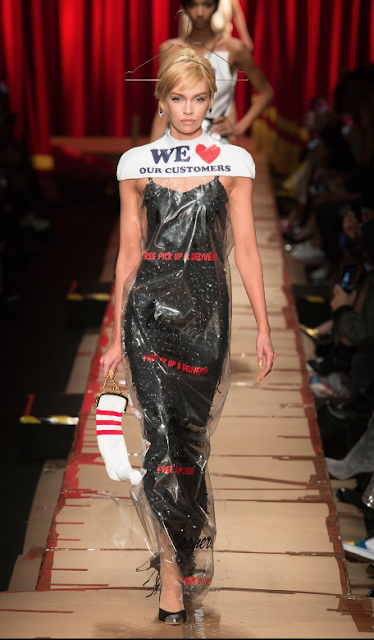 First, Nordstrom sold fake mud jeans and now Moschino is selling a dress that is modeled after the bag you get at the dry cleaner. Moschino sells this dress for around $737. 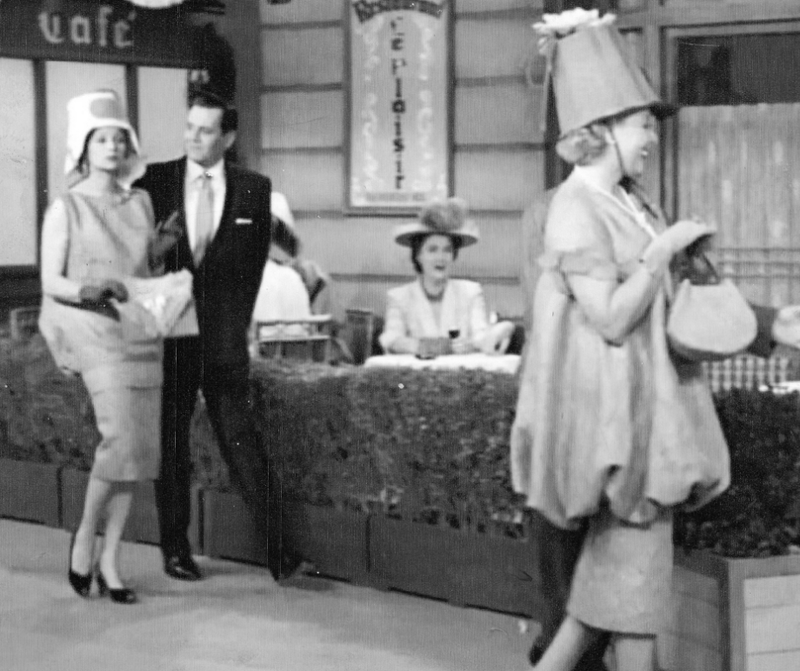 This truly reminded me of the episode of I Love Lucy, where Lucy and Ethel are in Paris longing to own a true Parisian haute couture gown. Ricky and Fred decide to trick them and construct a potato sack dress to tell them this is high fashion. 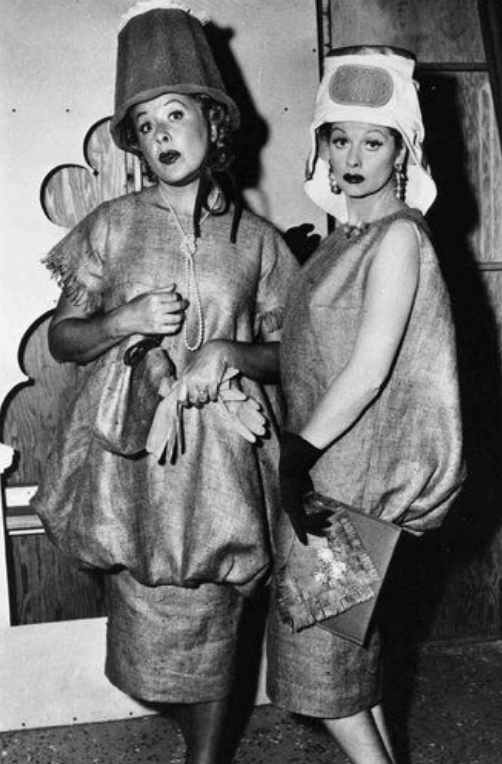 Lucy and Ethel are thrilled and wear their potato sack dresses out and about. When they discover they have been tricked, they throw their dresses away in contempt! But the next day... they see the chicest Parisian models wearing potato sack dresses. Here is another great testimonial on the ten-item wardrobe eCourse from Nora, who writes, "Hi Jennifer, I am so enjoying this course. I had (what I considered to be) a pretty minimalist wardrobe before, but I actually ended up donating 13 items of clothing after the first lesson! That might not sound like much, but I promise you it was a good chunk of my small wardrobe. I found a lot of value in this lesson, too. Your solution for people who don't like many (or any!) of the pieces they are keeping--update gradually with pieces that reflect your personal style--spoke to me on more than one level. There are a few pieces in my existing wardrobe that I'm not sure fit my personal style, but I also have found recently that I am SO OVER all of my home decor. I have replaced my old sectional with a lovely, modern couch and repainted my living room, but I find myself wanting to scrap it all and buy all new furniture right now! Your advice to slow down, save and budget, and replace pieces gradually in a responsible way has really helped me reframe my mindset about redecorating AND building my wardrobe! Thank you so much! Nora"
Hi Nora, I loved your comment! It's great to see that the ten-item wardrobe has given you self-discipline in other areas of your life. You will enjoy your new living room so much more if you take it slowly and don't go into debt over it. Congratulations! On last week's Thanksgiving post, DJ writes,"Jennifer, I loved all your tips. I'm glad you mentioned the bathroom as often it's forgotten! Always best to leave out extra supplies - extra roll of tissue, a few extra hand towels - go in and toss out the old hand towels after a while and hang new ones! Everyone appreciates a fresh bathroom! Something that saves me stress is to get my house immaculately clean the week before Thanksgiving and then all I have to do is tidy up the house the day before and add some fresh flowers. Use up the food in your refrigerator the week before and totally clean the fridge as you won't have room for any old food once you start using the fridge on T-day! I love Robyn's idea of keeping notes from year to year! Wish I had done that. Of course you should allow guests to bring a dish! When I'm a guest along with a dish or two, I bring the hostess a large poinsettia to help her start off the Christmas season the next day!" I loved your comment DJ. It's a great idea to get your house prepared in advance for hosting Thanksgiving. I'm wishing you and all of our American readers a very happy Thanksgiving this week! Today, I would love to know... what do you think about Moschino's dry clean dress? Would you pay $737 for this dress? What do you think of absurd fashion as seen on celebrities on the red carpet? Let me know and your comment could be chosen as comment of the week on the blog. There will not be a post on Thursday, in observance of Thanksgiving, but I will see you on Friday for a planning for Christmas video (with free printables!) See you then! As promised, I have the heatless curls headband tutorial today from SoCal Curls. This is a really innovative, stylish and gentle way to curl your hair. 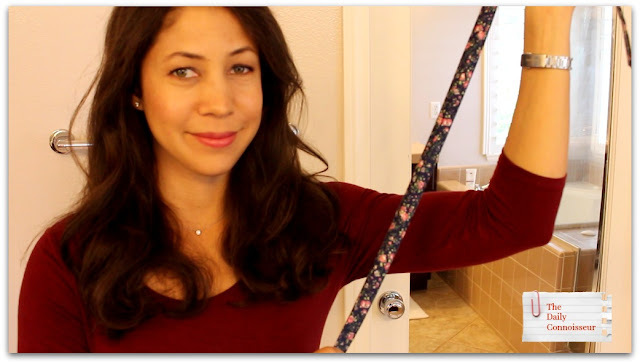 I'm wearing the navy floral headband in this video. 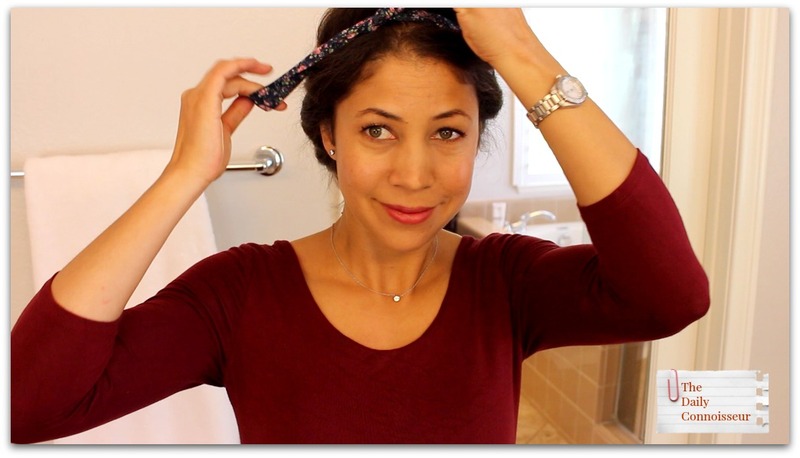 The headband method is innovative because you simply put the headband in the microwave for 30 seconds, then proceed to wrap your hair around it. After thirty minutes or more, you have beautiful waves! It's stylish because this is the first curling system that actually looks good while you are wearing it. You can even go out in public and no one would know you were curling your hair. It's gentle because this is a natural, no-heat method of curling the hair. I spray hairspray before wearing the headband and after releasing the curls to help my curls stay. 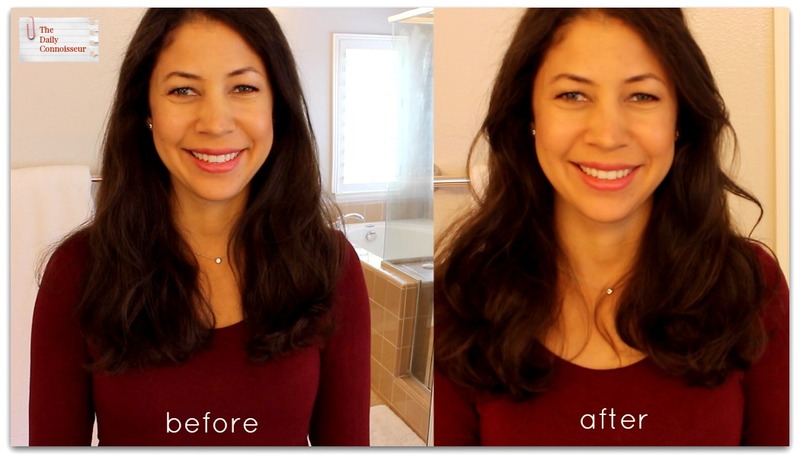 This is a much gentler way to curl the hair than using a traditional curling iron. I like both the Kenra volume spray and Kenra thermal styling spray. And please check out SoCal Curls website for all of their pretty headbands plus more tutorials. Here is a wonderful testimonial on the the ten-item wardrobe eCourse from Paula J, who writes, "Oh, Jennifer, I cannot adequately describe what the 10-item (capsule) wardrobe has done for me! First of all, I love the look of my closet. When we went to Harrod's in London last year I noted that the clothing racks in the women's and children's departments had quite a space between each item and one did not have to pull items away from each other to see them. That is how my closet looks now. 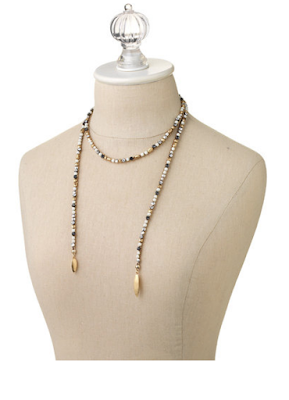 :) Secondly, I am excited to chose my clothes for the day and figure out the accessories. Thirdly, when I sort my clothes from the dirty clothes basket before laundering them, I am excited to see them and eager to have them available to wear again. (Who would have thought that would happen?) Additionally, I am finding myself taking time to take care of my nails, and I am finding that I can more easily pare down in other areas of the house. I have found it much easier to pack for a trip, also. I think you can tell that I am more than excited about this development! I have toyed with the idea of doing this paring down of my wardrobe before, but was intimidated. Your videos make it so easy to do. Thank you so very much for offering this class and for all of your wonderful videos and the help they give and the music you include in many of them. Very chic, Madame Jennifer!" Thank you so much, Paula J. I loved your testimonial! Today I would love to know what you think of the heated headband tutorial. Do you have any unique no-heat ways you curl your hair? Hosting Thanksgiving is a lot different than attending a Thanksgiving gathering as a guest. After hosting several Thanksgivings over the years, I have gathered together my best tips for hosting for this festive holiday. I hope you enjoy today's video! Don't forget to provide food before and after the Thanksgiving meal. Sometimes guests arrive hours before the meal and it's nice to have appetizers out to whet their appetite. This seems obvious, but sadly many people have had the experience of showing up with no food for hours. When hungry and thirsty travelers are coming to your home, you must feed them and give them refreshment. Accept help from your guests. Most people like to bring their signature dish. Make them feel special by complimenting them on this "famous" dish. Set the table the night before. Make your tablescape spectacular with what you already have. When you set the table the night before, you are able to really focus on the details and make it look special. For inspiration from previous years, check out My Thanksgiving Table 2015 and my New Year's Table 2016. Pre-cook as much as you can the day before, so the day of, you just need to reheat the dishes. The turkey is best cooked on Thanksgiving day. Place all of the little things like salt & pepper, water pitchers, etc. on the table before serving. Many times these necessities are forgotten and you end up popping up every few minutes to get them. Serve buffet-style for ease, especially since you don't want to crowd your beautiful table setting. Unless you have a very large table, it's impractical to have all of the serving dishes displayed on the table. Serve buffet-style and make the buffet look beautiful and enticing. Refresh the guest bathroom several times throughout the day. Try to go in at least once or twice an hour to make sure it's tidy and has all of the necessary supplies. My book, CONNOISSEUR KIDS, will be released in the fall of 2019 from Chronicle Books. Read all about it here. And thank you so much to everyone for your wonderfully supportive comments and input. I am really enjoying writing this book! Here is another great testimonial for the ten-item wardrobe eCourse. This course is inspiring. I'm so thankful for my friend who told me about this. I have to travel a lot and I am so tired of dealing with all the luggage. I live in a tiny house in a country that is not my own and storage is a problem. I have been reading up on capsule wardrobes and just didn't think I could do it. 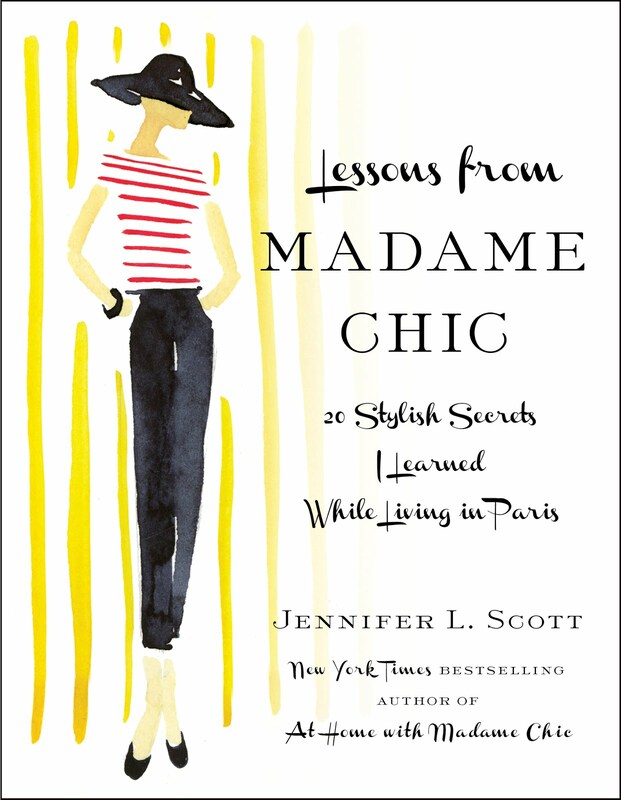 After watching this course, I bought your book Lessons from Madame Chic and I am ready to take the plunge. Thank you so much!!!! On the Traveling with Kids post, Gwen B writes: I love these tips and agree with them all. My girls are a similar age to yours at 8 and 4, and love travelling and flying especially. It is about the magic of it. When it gets turbulent my children love the "roller-coaster" experience, and aeroplane food can be a "midnight feast" or TV dinner. Seeing the excitement from their eyes helps so much. 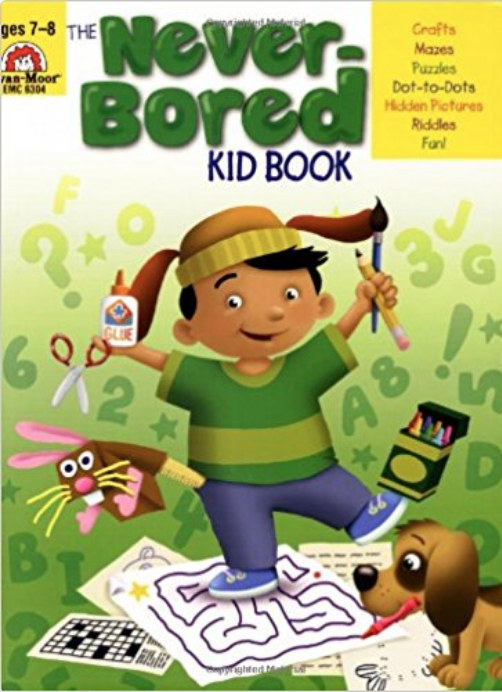 One thing that also works really well for us is to buy a magazine at the airport on the way out so they choose their treat and have something new for the journey, and save a new activity book for the long flight home. Always something fresh that way. Gwen, I love how you creatively re-brand the general airplane activities to make them more exciting for your children! I would love to visit Scotland one day. What a beautiful country from what I've seen! Thanks for your comment. Today I would love to know... have you ever hosted Thanksgiving? Do you have any triumphs to share? Any horror stories? Do you have any interesting stories from the guest's perspective? Let me know and your comment could be chosen as comment of the week on The Daily Connoisseur. I am so pleased today to finally announce the details on my next book, CONNOISSEUR KIDS, from Chronicle Books. CONNOISSEUR KIDS is a book on etiquette, manners and living well for little ones! It is an interactive book for the whole family, encouraging family togetherness and bonding over etiquette, manners and tidiness lessons. All parents want to raise well-mannered children. They are a joy to be around! This book will be a game-changer in the etiquette genre because it encourages the child to not only think about how they can live well through etiquette, but also why it's important and how it will help them in their daily lives. CONNOISSEUR KIDS will be released in the fall of 2019. As I write the book, I would love to hear from you! Please leave me your suggestions. What areas do you and your children struggle with? Table manners? Tidy rooms? Social interactions? Communication? As you look beyond your own children to society, what areas do you think parents in general need to improve upon? Please leave me your feedback below. I love to hear from you! I would like to thank my agent, Erica Silverman, at Trident Media Group, as well as my new editor, Sarah Billingsley, at Chronicle Books. I also want to thank all of you for your unwavering support over the years! I am so excited and feel very passionately about this next project and hope you do too. Today's video has been highly requested. It seems that many families are interested in how to handle traveling with small children. I have a lot of experience in this area and today I offer my top ten tips for you. We have three children, ages 5, 7 and 17 months. I've traveled everywhere from England with my two toddler daughters alone, all the way to Japan with my 3 month old baby boy... alone too! This time, my husband was with us and we were with all three kids. So whether you have a short flight over Thanksgiving weekend, a long-haul flight or even just a road trip, I think you can benefit from my advice in today's video. 2. Be prepared with snacks/ activity books (see my suggestion below). airplane pillow and headphones. Make sure they know they're responsible for it. 5. For babies, make sure you have different ways to carry them. Moby wrap or baby bjorn in addition to a stroller. 6. Have a sense of humor! Laughter is one of the best ways to dissolve stress. 8. Totally surrender. You won’t be able to relax with a toddler on an airplane. If you do, it’s a pleasant surprise! 9. Employ patience. Extreme patience. 10. Do what comforts you and try to focus on why you are traveling in the first place. 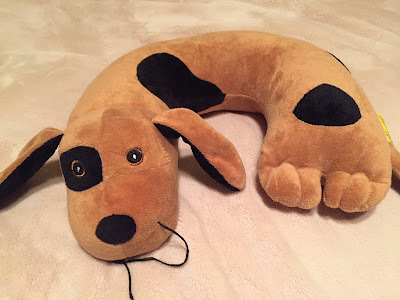 Kids airplane neck pillow shaped like a dachshund. These pillows were so welcome on the flight. The airplane no longer supplies pillows so I was grateful we brought these for the girls. Lil Gadgets kids headphones Again, the airlines don't supply headphones. 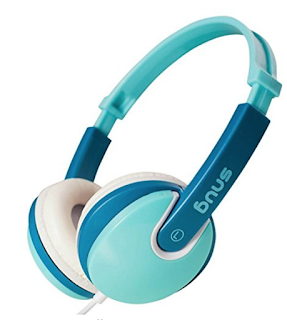 I find that these, which are made for children's heads work a lot better than the standard adult earphones. Be sure to stop back on Thursday for a major announcement! 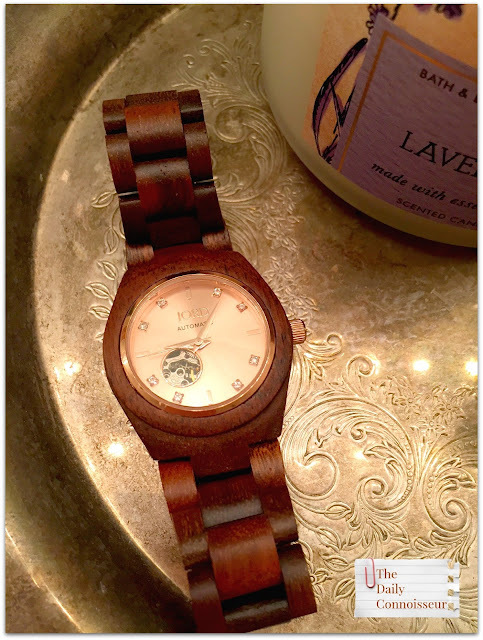 Jody writes: LOVE the Jord wood watches. I've been eyeing wood watches for some time and now you share this brand which is beautiful. Thanks for the opportunity to learn more about Jord and to possibly win! 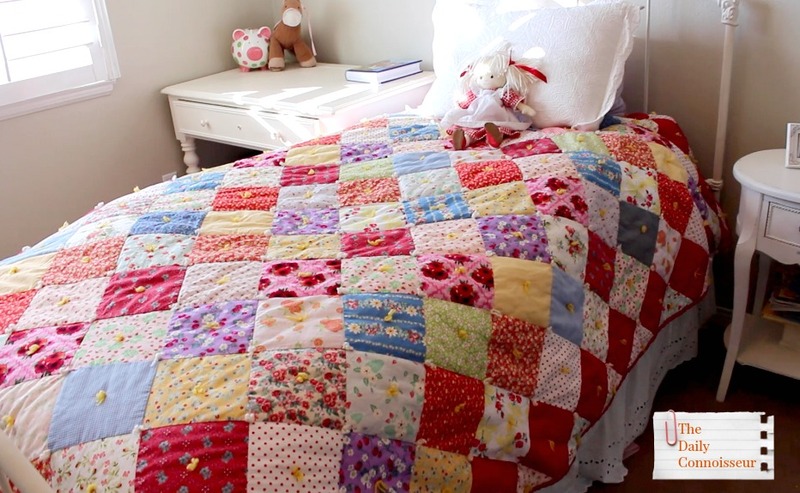 The girls' quilts are so cute! 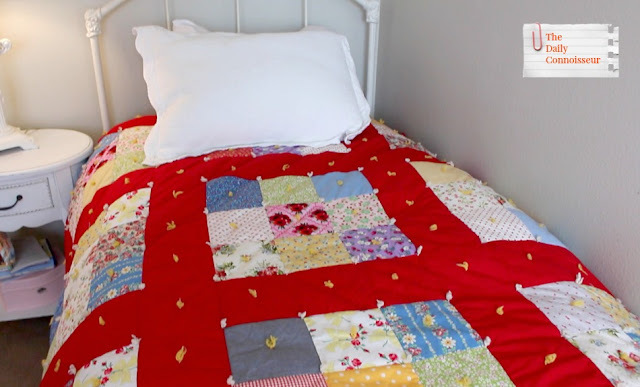 I'm in the process of making a quilt for my newest granddaughter so I have a great appreciation for quilts. 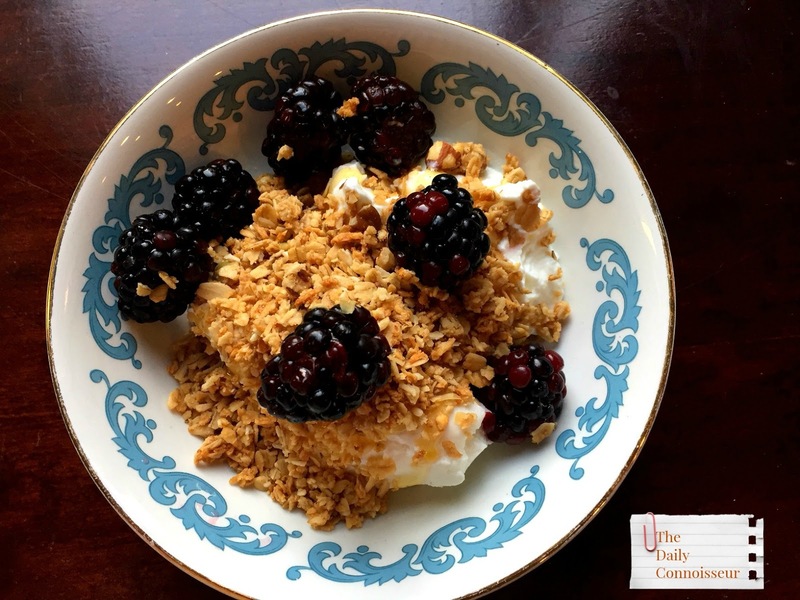 You really must make your own granola. It is SO delish. A good one is on the website: jennycancook.com. She's got some videos that are so much fun to watch and her recipes are all excellent. *Burning candles. I'm going to make some beeswax/coconut oil ones very soon. I can't do strong scents so this is what I like. *Making no knead breads. 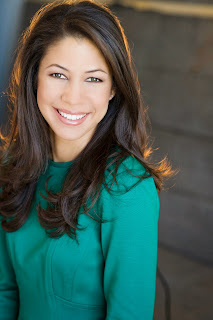 See jennycancook.com again. She's got several knockout bread recipes that I've been trying. The cinnamon rolls too! YUM! 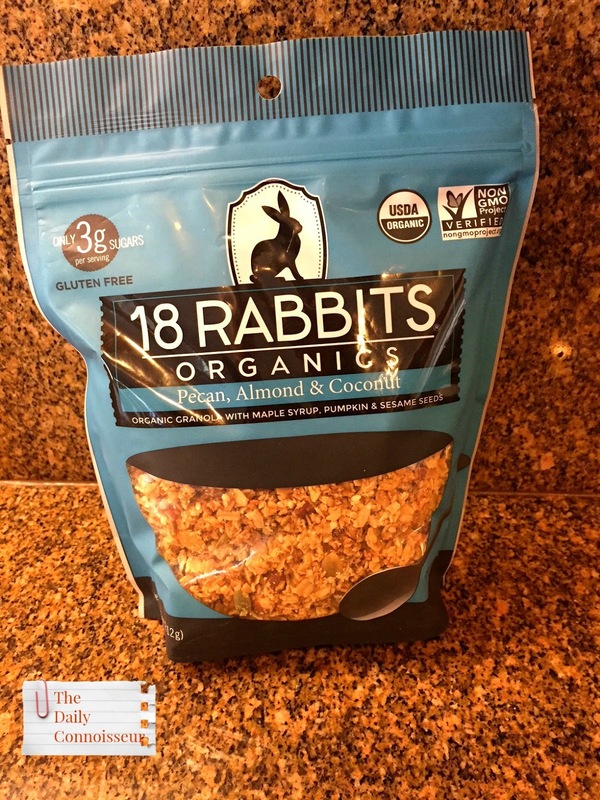 Hi Jody, Thank you for sharing JennyCanCook with us. What a wonderful site! Before we close, we offer our prayers for everyone affected by the horrible shooting in Texas on Sunday. Our hearts and thoughts are with you. Today I would love to know... what is your advice for traveling with small children? Do you have any triumphs to share with us? Any horror stories? Let me know and your comment could be chosen as comment of the week on The Daily Connoisseur. See you back on Thursday for a major announcement! Jord Wood Watches has generously offered to do a giveaway in today's October Favorites video for one lucky reader of The Daily Connoisseur. Jord Wood Watches are beautiful and unique handcrafted watches made out of wood. They have so many beautiful designs to choose from. I love the idea of wooden watches for the fall/ winter season. Enter the giveaway here. Jord will contact the winner. The giveaway ends November 26, 2017. My first favorite is the beautiful Cora watch in koa and rose gold from Jord Wood Watches. I chose this watch for it's beautiful dark wood and rose gold coloring. Lovely for autumn, feminine yet with a masculine touch. I love this watch! BEB Quilt Treasures made these pretty sister quilts for my daughters. They are so fun! I loved working with Beth and Eliot Bailey throughout the whole process. 18 Rabbits Granola pecan, almond & coconut This is my favorite store-bought granola on the market. So delicious! Krusteaz pumpkin Belgian waffles... speaking of delicious... these waffles are a tasty fall treat! 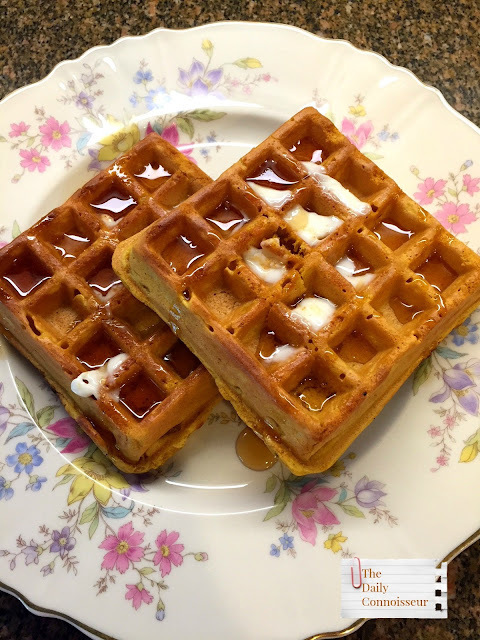 Please note: because these are frozen, I do not have a link to share for you, but found a Krusteaz pumpkin spice pancake mix for those who want to try it. SoCal Curls heated headband in navy floral This beautiful picture is from SoCal Curls website. Please look out for my future SoCal Curls tutorial. I really enjoy using this heated headband to create beachy waves. Simply heat the headband for 30 seconds in the microwave, wrap your hair around the headband and wear it for 30 minutes or more. 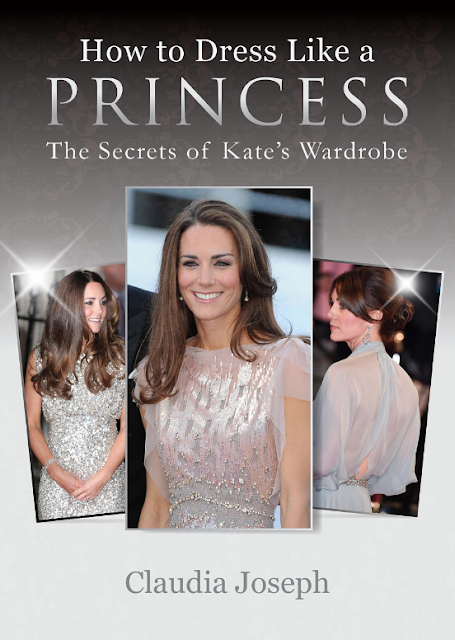 How to Dress Like a Princess: The Secret to Kate's Wardrobe by Claudia Joseph. This is a fascinating look into what makes The Duchess of Cambridge's style so timeless. In the book, Ms. Joseph also interviews my mother-in-law, about her shoe designing career, as her ballet flats are a favorite of the royals! 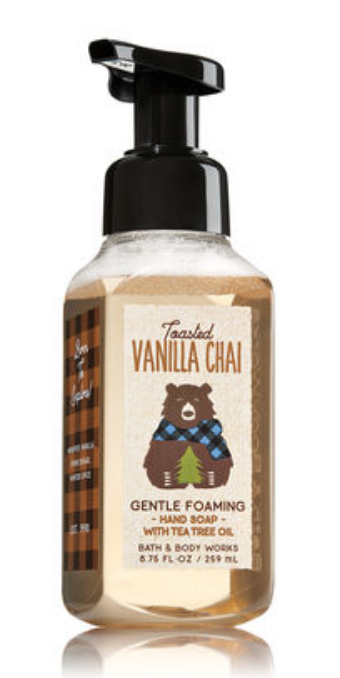 Bath & Bodyworks Toasted Vanilla Chai foaming hand wash. The scent of this hand wash is warm and delightful. It's truly a treat to wash my hands with this delightful soap. 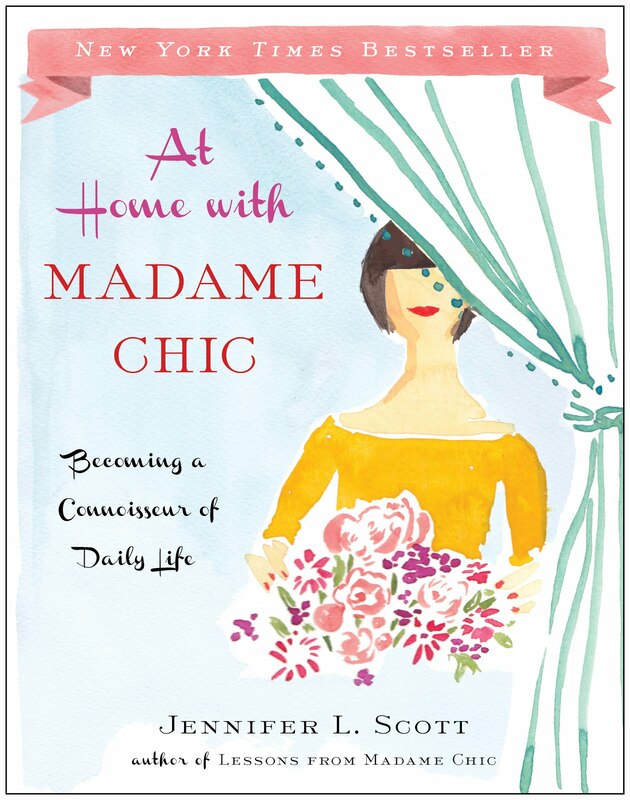 Nikki Moreno from Inspired by Nikki shares Lessons from Madame Chic as one of her October Favorites. Thank you, Nikki! Thank you to Jord Wood Watches for hosting this great giveaway! Today I would love to know... what are some of your fall favorites? Have a wonderful weekend and I'll see you on Monday.